According to the Centers for Disease Control and Prevention (CDC), there is currently widespread or regional flu activity in every state in the U.S. Youngsters and the elderly are particularly susceptible to the highly contagious H3N2 virus, this season’s predominant flu strain. Children, whose immune systems are still developing, help to spread the virus through simple respiration, as they actually exhale more flu virus than adults do. Seniors, who may have weakened immune systems, are more likely to come down with flu complications such as pneumonia. Other at-risk susceptible people are those with underlying heart disease, those with compromised immune systems and those who are morbidly obese. The CDC recommends that everyone over 6 months of age get vaccinated against the flu each year, yet studies show that less than 50% of Americans do. Although the vaccine is made from an inactivated virus and can’t transmit the infection, one of the persistent myths surrounding vaccination is the belief the vaccine will actually cause the flu. Another reason may be that some think the flu is harmless when it can be quite serious, as flu complications are responsible for approximately 36,000 deaths each year. According to the CDC, how well a vaccine works at preventing the flu varies widely from season to season. Two factors that play an important role in determining the likelihood of a flu vaccine providing protection include the age and health of the person receiving the vaccine and how well the vaccine is matched to the current strain of flu virus. If you do feel sick, how do you know whether you have a common cold or the more serious influenza? 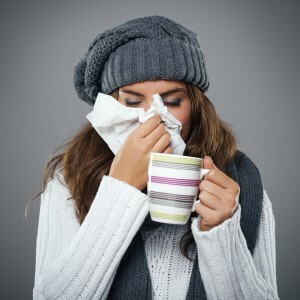 Cold symptoms generally come on slowly and can include nasal symptoms such as stuffy or runny nose, sneezing, and sore throat, which may be accompanied by a headache, a hacking cough, and some general aches and pains. The flu is likely to include the sudden onset of symptoms of fever, headache, muscle aches, joint pain, exhaustion, fatigue, a severe cough and may be accompanied by nasal symptoms as well. A cold can make you feel miserable, but a bout with the flu will send you straight to bed. As we approach the peak of the 2014 flu season, good health habits may help to protect you and prevent the spread of the virus. Keep your body hydrated. Staying hydrated helps to prevent drying of mucous membranes, preventing tiny cracks that allow viruses to enter. Avoid touching your face, eyes, mouth and nose to reduce access for airborne viruses to get inside your system. Eat a diet rich in plant-based foods. Fruits, vegetables, and whole grains are high in antioxidants and phytonutrients that are linked to enhanced immunity and faster healing. Keep your gut healthy with probiotics. Beneficial microorganisms aid gut and intestinal tract health by keeping pathogens in check. Probiotics from foods or through supplementation are believed to contribute to immune function, while aiding digestion and nutrient absorption. Exercise all year long. Don’t let winter weather prevent you from exercising. Moderate physical activity helps your body function optimally and keeps you healthier by strengthening the immune system. Supplement. A multivitamin and mineral supplement that contains 100% of the recommended daily values of vitamins A, B6, B12, C and D, and minerals chromium, copper, folic acid, selenium, calcium and zinc will fill in nutritional gaps and may help to reduce the risk of infection. Wash, wash, wash your hands often. And wash them properly by rubbing your hands together for at least 20 seconds Any type of soap will do. In the absence of soap and water, alcohol-based hand sanitizer can be used. Clean surfaces such as doorknobs, handles, keyboards, TV remotes, cell phones or any other frequently touched surface. Germs can live for up to 8 hours on hard surfaces. Detergents or chlorine, alcohol or peroxide based cleaners are thought to be effective against influenza viruses. Cover your nose and mouth when you sneeze. Uncovered sneezes can send airborne viruses up to 12 feet away! The best way to inhibit the spread of germs is to sneeze into a tissue and toss it in the trash. When you sneeze into your hands, germs still escape and can land almost 4 feet away. Sneezing into the inside of your elbow can spread germs up to 8 feet away. In the absence of tissues, use your elbow, but be sure to completely cover your nose and mouth. Avoid contact with others. This goes for both sick and healthy people. Aside from medical attention when necessary, sick people need to stay at home until they are fever-free for 24 hours without the use of fever reducers. Healthy people need to limit contact with sick people as much as possible within their own environments. If you do get the flu, bed rest is crucial to helping your immune system fight off the infection. Adequate fluid intake is necessary to prevent dehydration. In addition to water, try some warm, soothing liquids such as tea, broths and soups. While you may not feel like eating, nutritious foods including protein, carbohydrates and healthy fats will support your immune system and provide the energy needed to fight the virus and help you to get better. ViraClear EPs 7630 (Original) by Integrative Therapeutics – This homeopathic clinically proven extract helps to shorten the duration and reduce the severity of upper respiratory tract infections. Also available in an alcohol-free, cherry flavored formula for children. Echinacea Certified Lyphoherb Freeze-Dried Extract by Ecological Formulas – Active ingredients in this formula stimulate the immune system to combat bacteria and viruses that cause cold, flu and other infections. Zinc Lozenges by Douglas Laboratories – These pleasant tasting, natural orange flavored lozenges increase antioxidant activity and help fight infections by balancing the immune system’s response. Oscillococcinum by Boiron – Developed in the 1930’s, this homeopathic remedy helps reduce the duration and severity of flu symptoms especially when taken at the first sign of illness. This entry was posted in Home and tagged Echinacea Certified Lyphoherb Freeze-Dried Extract by Ecological Formulas, flu, Flu Season, Oscillococcinum by Boiron, ViraClear EPs 7630 (Original) by Integrative Therapeutics, Zinc Lozenges by Douglas Laboratories. Bookmark the permalink.